Pablo Venezuela Vivian from Sonora, Mexico, says he “completely turned my life around” with the online courses. And he has decided to take the knowledge and insights he gained and share it with many more. Vivian was addicted to crystal meth when his family sent him to a drug rehab center in Sonora. While there, a friend told him about the Volunteer Ministers online courses. He signed up for the “Answers to Drugs” course and found the information so impacting and useful, it helped him handle his addiction. He continued, doing the “Integrity and Honesty” course, then “Communication,” and so on until he had completed all 19 courses and said it was like a “college education on life.” With his own life saved, as he describes it, he wanted to give back, so he started giving seminars to others at the drug rehab center. A chef by profession, Vivian continues to volunteer at the center, delivering three or four seminars each week. Many who attend the seminars then sign up for the free online courses to learn the full data for themselves. He cites but one example: A man who attended Vivian’s seminar on Assists for Illness and Injuries approached Vivian afterwards and said that his mother had been in a coma for a week. Vivian visited her on two consecutive days and administered the “Unconscious Person Assist.” She came out of the coma on the second day. Online: The Volunteer Minister website received 1.6 million visits in the past year. 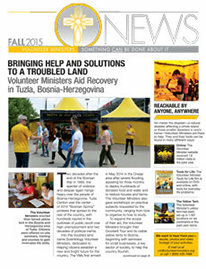 Tools for Life: The Volunteer Minister Tools for Life film is available on DVD and online, with tools for everyday life problems. 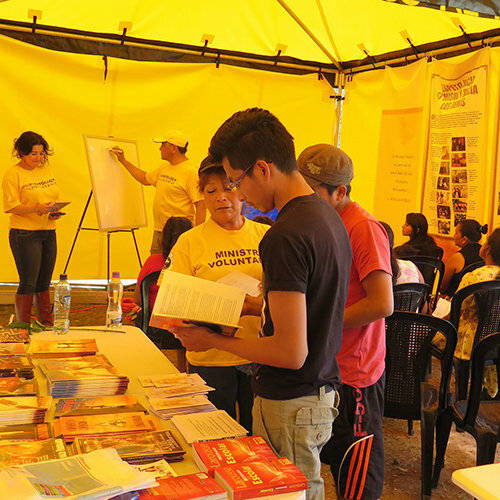 The Yellow Tent: The Volunteer Ministers’ yellow tent has been set up in 1,167 locations on six continents in the past year alone. The Volunteer Ministers are on call at any time to respond to any disaster, natural or manmade, to help those in need. Donations help support the transport of VMs across the world, and provide the vital basic resources for the victims of disasters—food, water, tents and medical supplies.